When Liu Jinshan signed on the dotted line to hand over his home and land to the government last July, the compensation deal made him a multi-millionaire overnight. With 2.4 million yuan ($350,000) in the bank, the 67-year-old farmer immediately splashed out on a car, two apartments and a shop in a new residential area in his native Harbin, capital of Heilongjiang province. "The apartments are for my son and one of my three daughters, and have already cost me about 1 million yuan," said Liu, whose windfall was eyed enviously by his neighbors in Hongxing village. "I still have another two daughters to look after and I have to be fair to them." Liu is among an emerging group in China: Nouveau riche farmers, who become wealthy after receiving large sums of cash from either governments or property developers as a result of the country's rapid urbanization. But quick fortunes can also bring a heavy burden: What to do with the money? The Harbin media reported that some people in Hongxing indulged in spending sprees for cars, luxury clothes and jewelry after receiving their compensation. Some even went broke after losing most of their cash gambling. Although villagers say these were rare and extreme cases, they admitted the considerable compensation has dramatically boosted consumption. Many have already purchased cars - usually moderate family cars but some gas-guzzling sports utility vehicles can also be spotted in this shabby and dusty village. Residents of Hongxing began greenhouse vegetable planting in 1996. Thanks to the short distance to the urban area, as well as a growing demand for fresh vegetables, the village became an important production base for Harbin, according to Liu Shilin, the village's Party secretary. "The business has been profitable in the recent years, therefore our villagers are much better off than average farmers in Harbin," he said. The annual per capita income of Hongxing is 8,000 yuan, according to one local newspaper report. The national average in 2009 was about 5,000 yuan. According to Harbin's urban expansion plan, the government will requisition all 3,600 mu (240 hectares) of farmland in Hongxing to build a new railway station. One-third of the village has already been acquired, with the rest to follow over the next two years. Compensation differs and depends on the types of vegetable a farmer grows, their planting methods and revenues. However, on average, each mu of farmland is expected to fetch 300,000 yuan, villagers told China Daily. The government will also reimburse residents for their houses, which will also be demolished. Some said they believe the compensation plan is generous, like Yang Feng, who is expecting his family's 5 mu of land to be requisitioned. "The government has already measured my house, which is around 200 square meters, and we're expected to move into an apartment building that is planned to be built not far from here," said the 70-year-old. "The government's policies have become more favorable to farmers in recent years and we're living a better life now," said Yang, the former village head. Yang, who lives with his son, daughter-in-law, and 18-year-old grandson, makes a comfortable living from his family-run supermarket and a small fertilizer plant. They rent out their land to others. However, not everyone agrees with Yang, and some of his neighbors with more moderate incomes are worried that taking the land away from them is like cutting off their last thread of security. "(The compensation) sounds like a lot but actually, on average, each person owns only 1.5 mu of land, at most 2 mu," said Xu Jianzhong, 40. Despite his concern, Xu actually stands to receive a hefty amount in compensation. He earns about 80,000 yuan a year from growing vegetables on 5 mu of farmland, which he owns along with his mother and his wife. 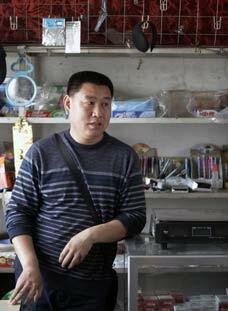 The family also runs a small grocery store, which adds another 20,000 yuan to their annual income. "The ownership of the land will expire in another 16 years if not for the land acquisition, so that makes life a lot easier for me." Under Chinese law, farmland is collectively owned, with small plots allocated to farmers on long-term leases. Xu will also automatically be registered for a pension when his land is taken, meaning he will receive about 400 yuan every month after he turns 60. Yet he still feels insecure about the future. "Compensation of 1.5 million yuan probably sounds like an enormous figure for now but think about what that money means in 10 years," he said, adding that he fears the money will devalue as inflation continues. "Think about the expensive education and medical services." His concern is typical among farmers who have lost their land in the rapid progress of urbanization in the nation, according to Wang Kaiyu, a researcher at the Anhui Academy of Social Sciences. Without proper education and training, farmers find it difficult to find stable jobs in cities and they have no land to fall back on, he said. Liu Shilin, the village Party secretary, also feels anxious about life after relocation. "I thought the compensation would be good for our village, but when I saw some of them spending heavily on cars, properties and luxuries, I realized that sudden wealth may not be a good thing," he said. He insisted that Hongxing officials have repeatedly warned residents to be careful about their consumption. "We have to be prepared for the bad days," said Liu. "People aged between 40 to 60 worry me most." The village government now plans to rent about 1,000 mu of farmland in nearby Hongqi village until 2027 so that experienced farmers can continue with their greenhouse vegetable planting. "Vegetables from Hongxing have already become a famous brand in Harbin," said Liu proudly. "The villagers have abundant skills and experience, and they want to find something to do instead of being idle." 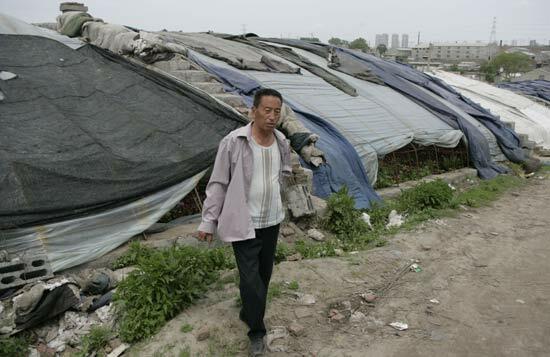 In recent years, land acquisition and relocation projects have become one of the most controversial issues in China, with forced demolition in some places arousing violent protests, including even self-immolation by so-called "nailhouse tenants". But the wind of change is blowing and major cities are now exploring what experts call "the new path of urbanization", which sees authorities make interest concessions to allow farmers to get a larger share of the profits from land sales. Hongxing village is not the only one that has benefited from this "new path". Located in the northeast part of Beijing, Dawangjing village is home to another legend of overnight wealth. After a real estate company purchased a plot of land near the village for 27,500 yuan per square meter in March - the most expensive piece of property in the capital - land prices in nearby areas have soared. As a result, the relocation project has brought Dawangjing's residents millions in compensation. 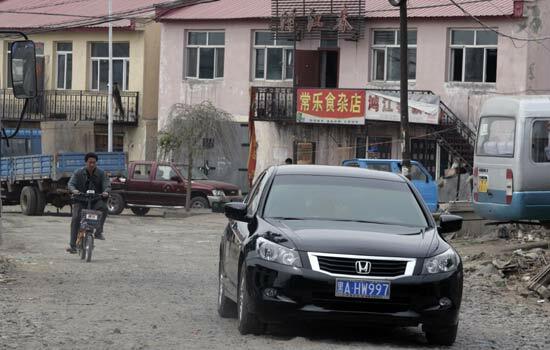 Besides purchasing cars, some villagers reinvested the money in property or played the stock markets, hoping to generate more returns, Beijing News reported. Allowing farmers to enjoy more benefits from rapid urbanization is a good starting point for social inclusion, which boosts social and economic development in the long run, according to Liu Shouying, a researcher with the State Council Development Research Center's rural economy institute. The previous model - in which the government received the lion's share from land sales - has pushed farmers to the brink of survival, he said. Land sales in China totaled 1.59 trillion yuan last year, up more than 63 percent over 2008, showed a report by the China Index Academy, which added that several cities, including Beijing, depend on such deals for almost 50 percent of their fiscal income. "Without a stable job, farmers' incomes dropped significantly, as well as their quality of life. This contributed to the increase of large-scale incidents in some cities," said researcher Liu Shouying. "This path of urbanization is simply unsustainable." A better way would be to reserve land for farmers to develop suitable industries, he suggested. When city governments make plans for industrial development, they have to include the farmers who sacrificed their land for those projects, so as to ensure the country's rapid urbanization progress will benefit all, he added. The pace of urbanization has accelerated in China in recent years, with the rate rising from 27 percent in the early 1990s to 47 percent in 2009, according to a report from National Bureau of Statistics. However, analysts agree that the trend is not going to stop - especially while the country's urbanization rate is still below the world average (about 50 percent) and far behind that of developed countries (85 percent). Li Anna contributed to this story.